Accessories: Accompanied by Patek Philippe fitted presentation box. Furthermore delivered with Patek Philippe Extract from the Archives confirming production of the present watch in 1948 with silvered dial and platinum bracelet and its subsequent sale on August 29, 1949. In production from 1932 until 1973, reference 96 was a stalwart in Patek Philippe’s collection. 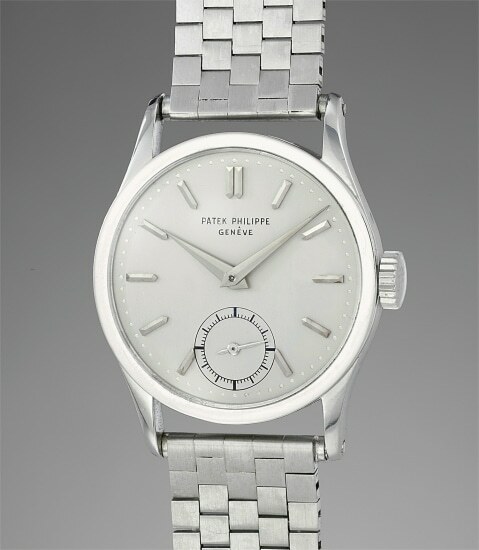 It is the first Calatrava model that Patek Philippe ever produced, ushering in a new era for both the firm and the dress wristwatch. It defined the Calatrava “style” while also being the first model to introduce numbered references to Patek Philippe’s timepieces. Cased most often in yellow gold, the reference was also produced in pink gold, white gold and most exclusively, in platinum. To date, no more than 7 platinum examples are known with lapped indexes, and the present watch is the only known variant to be fitted with lapped indexes and a bracelet, as confirmed in the Extract from the Archives. This timepiece is a superlative example. Preserved in exceptional condition, it showcases crisp lugs and full proportions. The platinum marks on the case are crisp and highly visible even without the aid of a loupe. It is furthermore accompanied by luxurious Patek Philippe Gay Frères platinum bracelet stamped for 1948, corresponding to the year of manufacture. Such stunning examples hardly ever come to the market, and when they do, it is an occasion to be celebrated.